Reserve your space for an experience full of adventure and friendship! REGISTER NOW or learn more about our values and how Go West campers build 21st Century Skills. WHAT’S UNIQUE ABOUT GO WEST? 3-week sessions give kids the time and opportunity to make meaningful friendships, build a supportive community and develop skills. Learn more about our day camp programs. Andrew and Arianne, Go West's owners and directors, know your camper and your family because they're at camp every day. Learn more about Andrew and Arianne. A low staff to camper ratio and small groups guarantee individual attention. Learn more about our staff. SEE GO WEST CAMPERS IN ACTION! The best way to get a snapshot of what a session of Go West is like is to check out our slideshows. Check out slideshows from previous summers. WHY IS CAMP IMPORTANT FOR KIDS? HOW DO YOU CHOOSE A CAMP? Do you need help deciding if a camp is right for your family or want to learn more about the benefits of camp for kids? Arianne shares her perspective as a parent and camp Director in the Woodmen/Cheyenne summer camp guides. For more about the benefits of camp, read Andrew's thoughts about how camp helps kids grow in the Colorado Springs Independent. We love talking about camp. Give us a ring at 719.357.8872. Together we discover the wonders and adventure of exploring our own backyard and take to the neighborhood. We take advantage of the summer sunshine, nourish our bodies through physical activity and fresh food, and challenge our minds through activities that encourage exploration and innovation. We create a community that supports skill development and helps kids to be successful as they grow. At Go West we're committed to getting kids out "ON THE GO". We travel on foot and by pedal power. Whether it's off to the park or to explore a nature spot, we walk or ride to get there. From avid bikers and hikers to beginners, everyone joins in the fun. Our fleet includes bicycles of all sizes to fit every camper. Each three-week session includes a course in bike safety, general bike maintenance and navigation skills. Summer isn't complete without a little adventure. 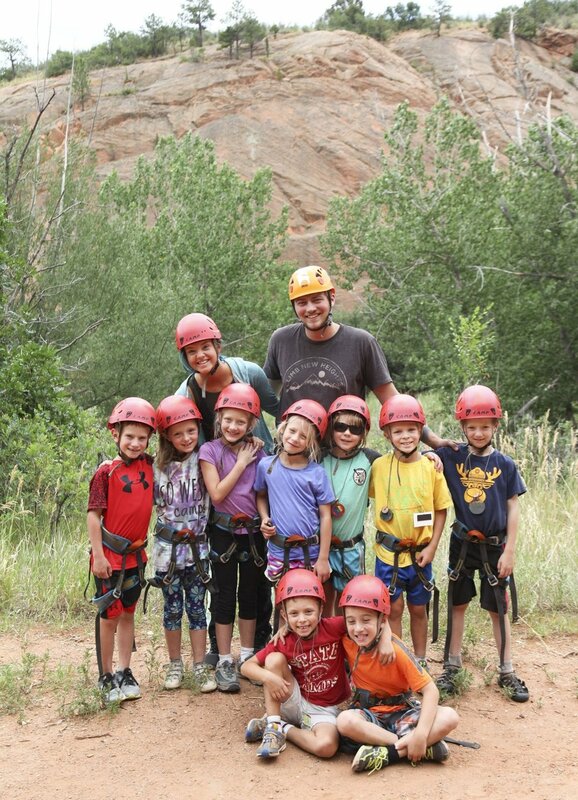 We rock climb in picturesque Garden of the Gods, Red Rock Canyon and North Cheyenne Canyon. To beat the heat of those dog days of summer, we head over to the waterfront at Quail Lake and Palmer Lake where we standup paddle board. More experienced cyclists hit the trails at Ute Valley Park and Red Rock Canyon, learning to navigate the off-road terrain. 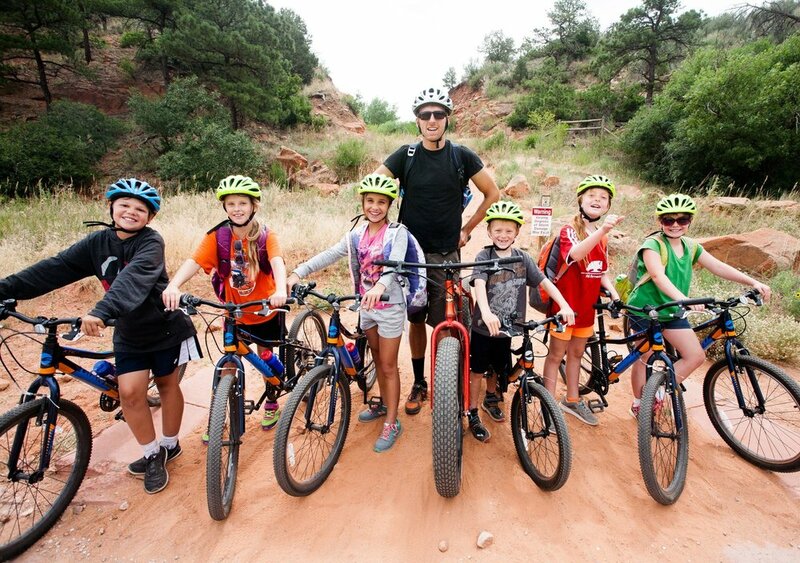 Campers will have a blast on our fleet of "Fat Bikes". Campers build an appreciation and understanding of nature through hands on wildlife and pond exploration programs and learning Leave No Trace principles. Arts programs including photography, drawing and painting allow campers to express their creativity. Archery helps campers learn patience and persistence. Team building and group games help campers build community. What else do we have in store this summer at Go West? Explore our DAY CAMP schedule and age groups. From seed to lunchbox, we think it's important for campers to have a hand in the process. Planting, watering, weeding, harvesting...we do it all. Caring for our community garden is a team effort, and we all get our hands dirty. The delicious rewards are the perfect match for our camp lunches and snacks. What's cooking this summer? Find out more about LUNCH at camp!